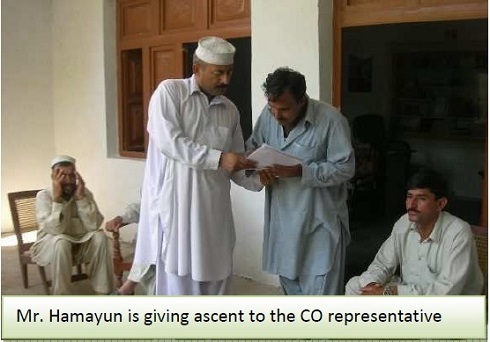 The Creative Development Organization (CDO) is a non-profit organization (NGO) established in 2010 to initiate development projects in disadvantaged communities of Pakistan. This project aimed at encouraging 40 school children to go back to school. Absent-ism increases after the summer school vacation. Children from poor families tend to work for money rather than go to school. The project used various strategies to motivate parents and children to go back to school. Counseling parents about the importance of education for their children as well as giving children free school uniforms and bags of supplies worked as incentives to pursue education. The uniforms and bags were sewn by women who were trained on sewing skills in a previous SHARE-funded project. 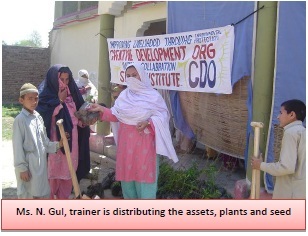 This project trained 23 females in basic agricultural activities. Agricultural experts worked with women to teach them about agricultural practices suitable for the area. Eight families received agricultural tool kits and packages of vegetable seeds. One of the beneficiaries is a widow. She has four daughters and a disabled son. She used to worry about having food for the family and medical expenses for her disabled son. After growing vegetables in her house garden, she is able to meet the food needs of her children, share with neighbor some of the surplus vegetables. The children are very involved in the planting and harvesting of the vegetables. Creative development funded 25 widows and economically disadvantaged women with chickens to raise and sell. The sale of eggs helped increase their income. The cost of the required school uniforms can be prohibitive for some of the poorest students in the Tehsil Takht Bhai area of Pakistan. With funding from SHARE Institute, the Creative Development Organization CCDOS provided 49 children uniforms and school bags. Widows were hired to sew the uniforms, so that they too could benefit from the project. 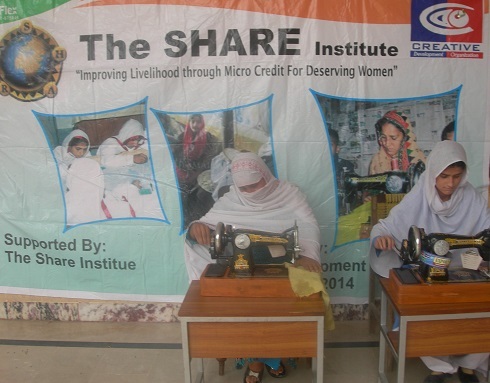 This micro-credit project trained 82 women and purchased 8 sewing machines. Skill enhancement training classes were attended by 82 women. Also,they learned about business management techniques. Success Story: Miss Nusa, a widow who has three daughters and a son living with her in a 100 square meters rented house. Her deseced husband was a poor person who earned his wages by selling a variety of small items at a bus stop. His monthly income was barely Rs. 8,000 (USD 80). He used to wash vehicles and sometimes worked as organizer of vehicles. He was a very hard working person and used to work nonstop till his very end. However, due to intense poverty, poor health and lack of proper medication Mr. Ali Khan died a year ago at the age of 62. He left his daughters and son to his widow who had difficulty supporting her family.. . She had to live from charity and wages that came from working domestic chores of others. One of her daughters was also working with her in management of a household. Creative Development Organization came to learn about this poor widow.Ms. Nusa joined the project activities and learned how to sew.Now, after two months, her business has been established, she has earned enough to buy another an embroidery machine. She is not sewing clothes for children from pieces of clothes she managed to buy. She is now very happy and has a future plan to earn about Rs. 35,000 each in coming Eids (Muslim Religious Festivals). She has started getting orders of sewing clothes for the coming Eid ul Fitr now from 80 neighboring women. Only this would earn her about Rs. 22,400 in a month only from sewing. 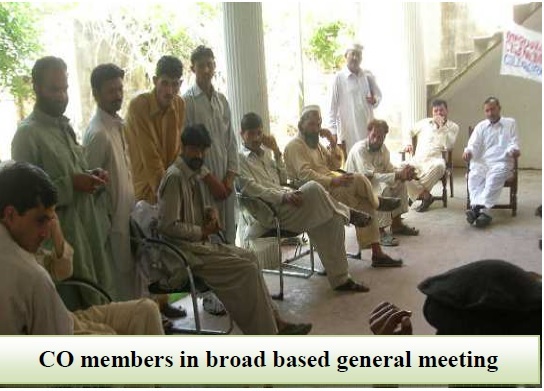 Creative Development Organization in Pakistan continued working in the district of Mardan Khyber Pakhtunkhwa. The project trained 103 women on Skill Enhancement Training. Eight women were selected to learn sewing, and marketing skills. Beneficiaries were successful in sewing clothing, and doubling their income. Most of the newly earned money was spent on food, and educating children. 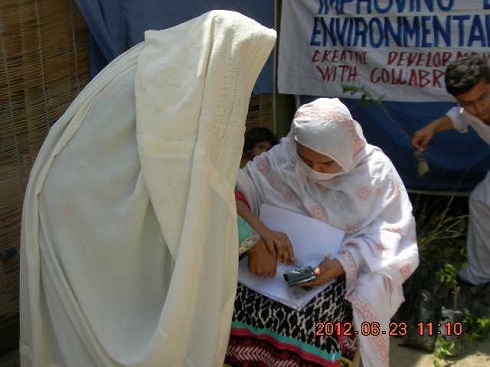 Creative Development Association in Pakistan was funded for a project entitled “Improving Livelihood through Micro-Credit for Deserving Women.” This project established a skill center where training for women was conducted in sewing & embroidering skill enhancement, enterprise development, and linkages development. A total of 72 poor women were trained in sewing and embroidery skill enhancement. 70% were able to start new businesses immediately after completing the training. The 8 most vulnerable women were also trained in enterprise development, introduced to business contacts, and given materials to start sewing businesses. These women increased their incomes by an average of 70% and business assets by an average of 25%. Miss Rozena, a 38 year old widow and mother of five, was unable to find stable income and could not send any of her children to school. She was trained in sewing over 35 days and immediately started her business with the funding she was granted. She was also given links to local businesses that could use her service. She has now almost tripled her income and has been able to send two of her children to school and purchase a workshop table for her business. Shamim is a 39 year old mother of four whose 70 year old husband was having trouble supporting the family because of his advancing age. Their two oldest sons are disabled, and the eldest needs constant care. Shamim struggled with depression from poverty and the inability to care for her family. After the training and support of the project, Shamim was able to start her own business and help to support her family. Now her two youngest children can attend school, and she is able to afford medical care for all of her children. 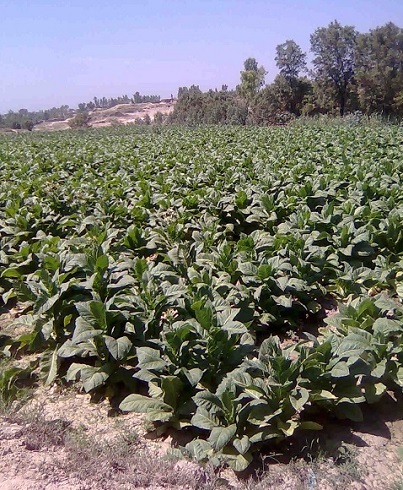 The CDO implemented a project to improve the health and well-being of community members living in the Jalala Union Council region by promoting environmental protection. 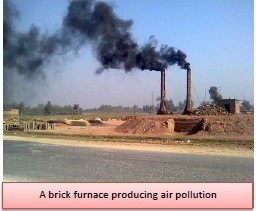 Individuals living in this region of Pakistan suffer from a number of health problems associated with harsh environmental conditions such as contaminated air and lack of plant life. The Environmental Protection Project held 20 information sessions to improve awareness about the benefits of planting trees and protecting the environment. Tools, seeds and plants were distributed among selected participants so that they could begin growing new trees and plants in the region. CDO also conducted health seminars to encourage good hygiene habits in low income communities where illness rates are high and knowledge of hygiene and cleanliness are low. Because of the success of the initial project, SHARE funded CDO a second time in 2012 to allow the organization to continue their efforts in more communities. Community members cleared away debris, planted trees and were taught how to care for the trees. 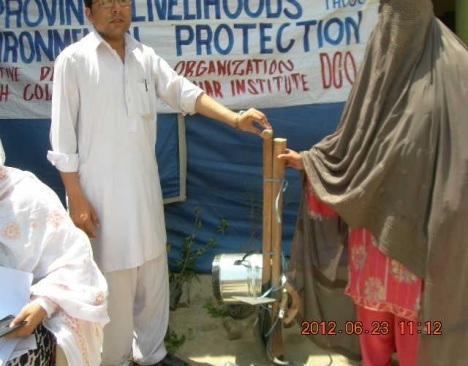 The Share Institute funded CDO for a cleanliness and hygiene campaign to improve the lives of community members. 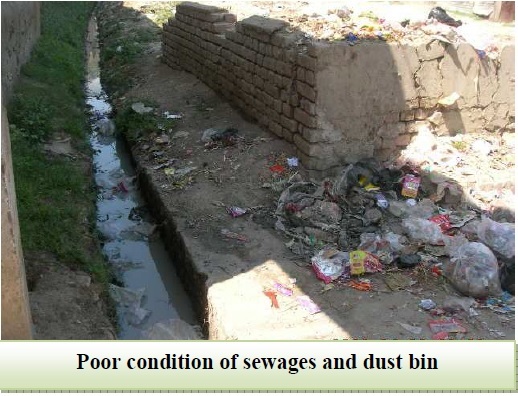 Social awareness sessions were conducted to improve the awareness of community members about hygiene and cleanliness. 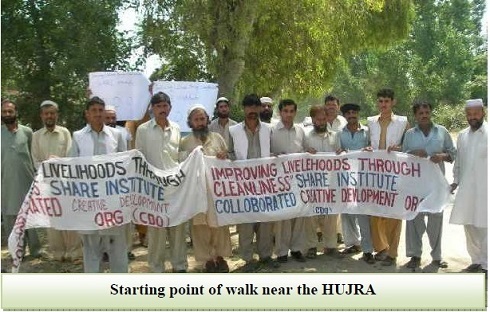 Awareness walks helped to mobilize community members. 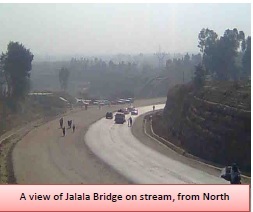 Groups were sent out to clean up local areas. 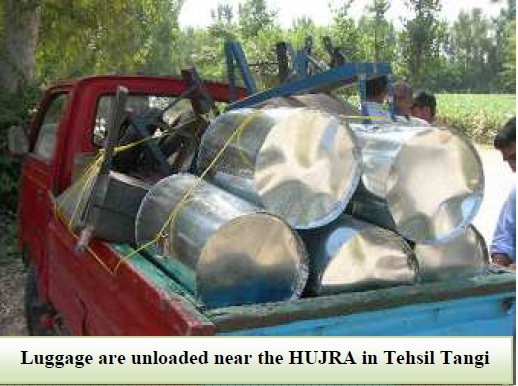 Rubble and garbage was removed from residential areas.